NOW AVAILABLE! – – – -Boreal Brew – Alberta Species at Risk Beer Labels – Pop da Top! Well it’s finally out! Not only was I lucky to get my painting on the label, but I got to name the beer too! Booyah! This is a pilot project by the Alberta Chapter of the Wildlife Society (ACWS) (http://joomla.wildlife.org/alberta/) to help raise awareness and funding for Species at Risk in Alberta. A portion of the proceeds from sales of the beer will go towards helping Species at Risk conservation. ONLY YOU and your friends and everyone else who puts their common cents into purchasing these specially labelled bottles can help Species at Risk in such a noble and unique give and take fashion. It’s like the symbiotic relationship of the honeyguide and the Maasai… the ox and the oxpecker…..
On a serious note though, these species need our attention. Helping out in any way is a step towards a positive future for them. This amber ale from Alley Kat Brewing Company (http://www.alleykatbeer.com/) in Edmonton, Alberta, is available thus far in only two stores. They can be purchased at the Sherbrooke Liquor Store in Edmonton (http://www.sherbrookeliquor.com/) (780-455-4556) or at the Kensington Wine Market in Calgary (https://www.kensingtonwinemarket.com/products/details/inventory/18121/index.php) (403-283-8000). Congratulate yourself for your support! Every time you open one of these beers, you can magically celebrate your contribution to conservation by opening another one! It’s endless! 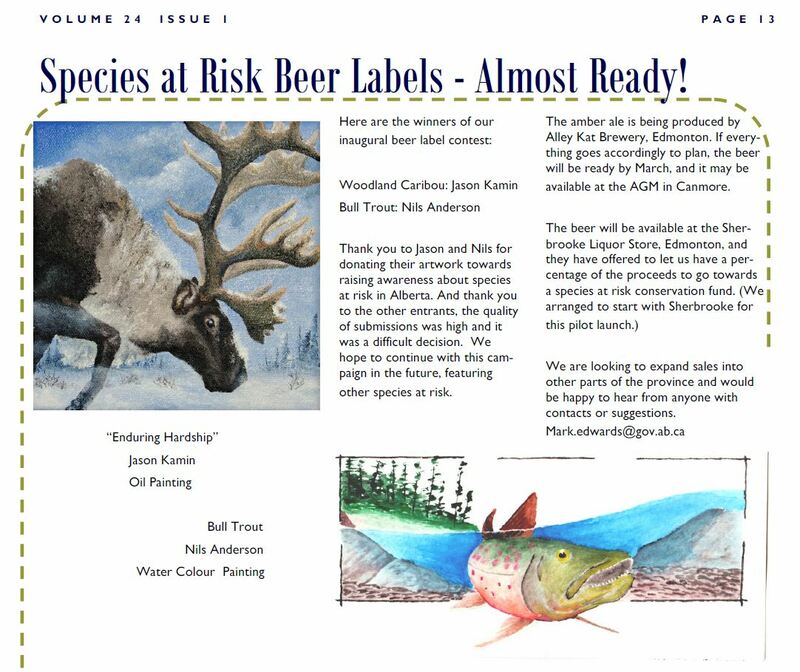 The Alberta Chapter of the Wildlife Society is partnering with Alley Kat Brewery and Sherbrook Liquor Store in Edmonton to bring art, conservation and beer together. 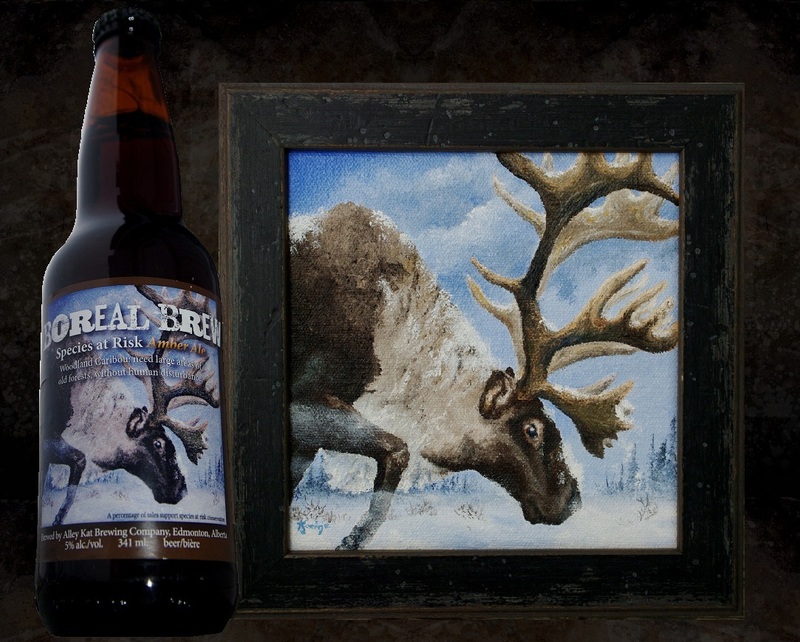 Jason’s art – “Enduring Hardship” – a painting of a Woodland Caribou, has been chosen as one of two labels that will represent Species at Risk wildlife in Alberta. A percentage of the proceeds from the sales of these specially labelled brews will go towards conservation efforts in Alberta. When you buy this beer, you’ll be helping wildlife! Yeah! The clip below is from the ACWS January 2013 Newsletter. Updates will be posted on the release date of this extra special elixir, and where you can get it! Welcome to Jason Kamin’s Art Space ! Thanks for visiting! This post marks the launch of my new blog website. It’s designed to let you see the artwork I do and provide your opinion on what you like. You can follow my blog to see how things develop by signing up in the right hand column under Follow Blog Via Email. 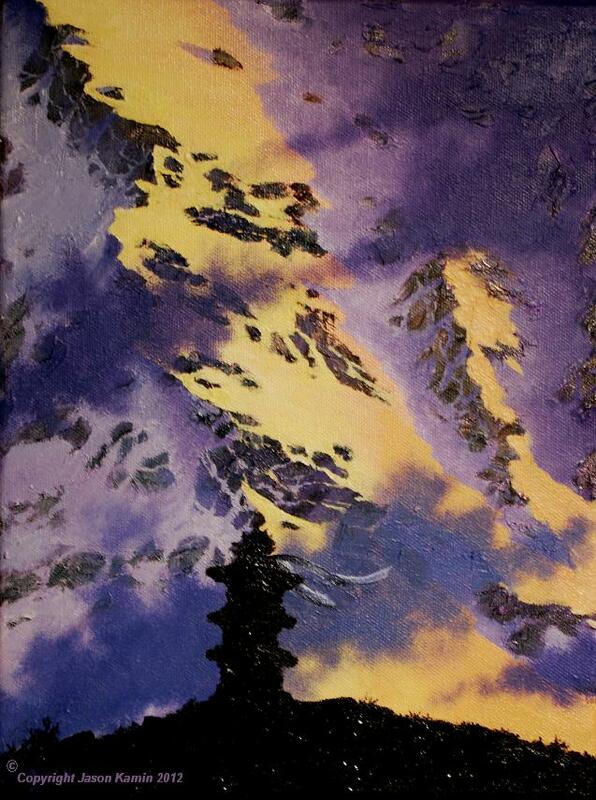 Most of the paintings that are not marked as (SOLD) are available. I also provide commissions upon request. Contact me for further details! Enjoy the paintings, and check back for updated postings, paintings, events and expedition announcements!